anything but khakis – Own your life story. Frank: What you drinking over there, boss? Me: No idea. I think it’s called a mystery, snazzy cocktail. Regardless, it’s delicious. Frank (to bartender): I’ll have what he’s having. Me: What’s your name, my man? Me: Benj. Pleasure. What’s your story, Frank? Me: You want the long version or the short version? Frank: Depends on how interesting it is. Me: Well, I just quit my corporate job in Charlotte, NC and sold most everything and moved to Mississippi and moved my family down here and we are kinda in limbo but it is quite exciting and very interesting and I just explore and the rest of the family is wildly happy living out on a farm and it is a complete 180 and totally unique but we all kinda do whatever we want now hence why I am sitting at the bar at the Ace Hotel in New Orleans at 3:30pm on a Tuesday drinking fruity drinks and talking to you. Bartender: Wow. I think we might want the long version. Me (to no-nonsense Frank): How’s the drink? Frank: Fantastic! You know, I’ve got a buddy in the mountains of Colorado that kind of did the same thing. Invests in real estate now, so really doesn’t DO much. Me: Yeah, I don’t think people realize there are a million unique ways to make money. It doesn’t have to be the key focus in life. Happiness and doing what you want with your time should be up there at the top too. Frank: So I told you I travel a lot, but you know what? I just got rid of my car. It’s cheaper, and it’s less of a nuisance. Me: Tell me more. I am in the process of removing as many nuisances from my life as possible. Frank: I just don’t need it. Me: I’ve learned that there are a lot of things in life that we really don’t need. Bartender: And, car insurance in Louisiana is ridiculously expensive! Me: I was on a swamp ride this morning, and that’s what everyone was talking about. Must really be expensive. Frank: So why here man? Why New Orleans? Why the Ace Hotel? Me: I love this place, Frank. It’s like my centering place down here. It’s weird and unique. It’s extremely diverse. And I always feel welcome. Follow along on Instagram @anythingbutkhakis and @abkgolf. If you enjoy these and would like to get the weekly piece via email, please follow on the website http://www.anythingbutkhakis.com . I put myself on the 15 day disabled list last week. After almost 2 years of sleeping in weird beds, showering in tiny showers, ubering in Ford Festivas, and flying in seats meant for my son, my back had had it. So I shut it down. To follow my dreams, I need my body functioning at full capacity. As such, I had some time last week to think, and two questions I have been asked recently cropped up: “Do you miss North Carolina?” and “Is Mississippi now home?” The answer to both of these is “no” because for me, home is not a specific place, it is a feeling. For years, I have been fascinated with the east coast vs west coast debate. NYC vs LA. His happy place vs her happy place. The north vs the south. Rural vs urban. And so on. You should know by now that it is not enough for me to just hear about it. I want to experience it myself. Feel it myself. See what all the fuss is about. And so I did. And I wrote this article a few months ago about trying to find my happy place and subsequently didn’t think too much more about it. But since I am laying low for a couple of weeks to rehab my back, I re-explored the topic. And by God, I think I have found some happy places. Places that make me emotional. Places that make me feel alive. Places that if you invited me right now, I would ask how soon I could meet you there. So, here they are. My top 15 over the past few years, in order, with a few tidbits for you to savor. St. Augustine, FL, springtime. Have an ice cream or some fudge and just walk around. Take pictures of yourself with the palm trees, obviously. The Open Kitchen, Charlotte, NC, $1 beer night. Go back in time and order old school Italian classics washed down with yes, $1 beer. The Ace Hotel, New Orleans, LA, happy hour. Grab a drink and a couch, and maybe the poet in residence will find you. Seriously, last time she wrote me an impromptu haiku. St. Elmo’s Steakhouse, Indianapolis, IN, Pacers game night. Grab a seat at the bar, get the world famous shrimp cocktail and filet, and make some new friends. Fulmer’s General Store, Richton, MS, lunchtime M-F. $8.99 for meat and 3 sides, dessert, and sweet tea. Shop for candy, fresh vegetables, or cowboy boots afterwards. The world needs more of these places. Beverly Hills Hotel, Los Angeles, CA. Nostalgia, nostalgia, nostalgia. Ooh, I felt it. And I ate lunch two seats down from Atlanta Falcons QB Matt Ryan (that almost ruined it for me). First Energy Stadium, Cleveland, OH, winter. Want to feel alive? Maybe the Browns will play your team on a cold December day. Go. Make a weekend of it. Explore a wonderful city, but please, bring an extremely warm jacket. Wells Fargo Championship, Charlotte, NC, first week of May. Best week of the year in Charlotte. Check out the celebs in the pro-am on Wednesday, and then party with everyone else in the city Friday and Saturday. FYI, no one works that week. Hazeltine National Golf Club, Chaska, MN, autumn. Indulge the Minnesota hospitality, the beautiful leaves, Lake Hazeltine, a walk with your friends, and dinner afterwards. Oh yeah, the golf is also really good. Cameron Indoor Stadium, Durham, NC, pregame. Get there an hour early and savor the pregame shenanigans. My personal fave is when the students sing “Every Time We Touch” and then go nuts! I just got chills writing that. This is a must do! 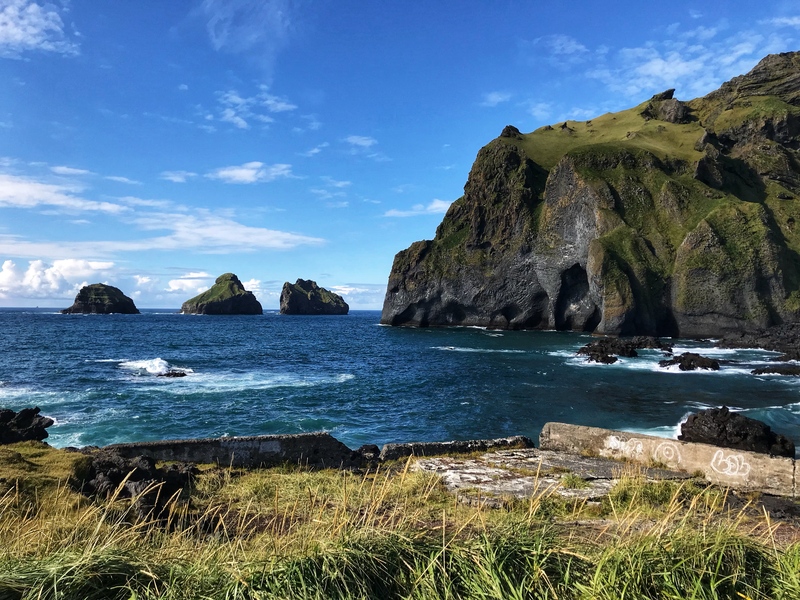 Vestmannaeyjar, Iceland, not winter. Likely the most unique place I have ever gone and might ever go. Spectacular. For the full recap, read here . Pride Park, Wingate, NC, fall game night. This truly is home for me, both literally and figuratively. Prove it? Three years ago, I flew home early from an NYC vacation to watch an important soccer game. Pinehurst Resort, Pinehurst, NC, spring or fall, sunset. Walking up 18 or enjoying some time on the veranda at sunset with the local church bells chiming is hard to put into words. You literally feel the ghosts of legends past all around you. If I ever feel that I need to join some big time club, this is 1A. Happy places and “homes” are everywhere. Just remember, you don’t have to feel boxed in by the normal definition, aka where your residence is or where your parents went or what anyone else is doing. I personally get my rocks off finding people, places, and things that, like David Chang said, are unlike anything else. So just get out there. Explore. I never would have found most of these if I didn’t do just that. Why on God’s green earth would someone willingly choose to move to a place that is last in many categories where you want to be first, and first where you want to be last? For Christy, it was family. For me, it was freedom. For Banks, well, he likes to pee in the yard (true story). You have to remember that I am proudly an outsider on most things. A temporary guest (we all are, really). A free thinker. I don’t need to impress the neighbors. I used to view it with uncertainty, but wow, it is indeed the ultimate strength. Thus, my criteria is always going to be a little different from the norm. Stats don’t faze me. Ratios don’t scare me. It’s just gossip fodder. Are we trying to raise a well-rounded, happy kid or send someone to the moon (coincidentally, Stennis Space Center is right down the road)? Temperature-wise, there are 10-11 outside months in the year. The world famous (and my absolute favorite) The Shed BBQ is 5 miles away. New Orleans is 100 quick interstate miles away. The Hornets played at the Pelicans last week, the Panthers will play at the Saints, and the locals tailgate before everything. Everything. I can see I-10, my driving gateway to the world, out the window. A major international airport is an hour and a half away. Minor league baseball is $7 per ticket and only 15 minutes away. I wake up on the water. It’s 5-10 miles via boat to uninhabited islands. We saw comedian Sebastian Maniscalco last week, one of the many weekly big names at the Biloxi casinos, which are only 15 minutes away. We went house hunting via boat, a ridiculous new adventure. And 5 of the top 10 golf courses in the state are within a 45 minute drive. One of these is Fallen Oak, #1 in the state, top 50 in the country (stats, I know), and where I watched last week’s PGA Champions Tour event. So what were you telling me about the stats? The ratios? The gossip? The riff raff? All the why nots? Just like sports, just like March Madness, life isn’t lived in the stats. It’s not lived on paper. You have to play the game, and sometimes, just like last year, the 16 seed finally wins. Follow along on Instagram @anythingbutkhakis and now @abkgolf. Inexplicably, I now wake up earlier than I did when I had a normal job. I have to take my son to school. I WANT to take my son to school. It gives me great joy. Great pleasure. It makes me feel like a man. I also pick my son up from school most days. He is 1 of 8 kids in his class. I sit in the pickup line watching him play, and I have never been happier. I am now on Central time. I still wear my watch proudly. I have no idea why. The landscape is green. Like green, green. Like Augusta green. Already. The azaleas are everywhere, and they are loud. I slow down every time I pass them to make sure I take in their beauty. When it is quiet, I can hear my heart beat. The golf ranges from damn good to exceptional. Google Dancing Rabbit aka “The Augusta You Can Play”, a course that ate my lunch last Wednesday. The problems with society are right in front of me. I see them daily. I feel them daily. Unlike in a big city, there is no place to hide them. Down here, dogs are just dogs, and many roam aimlessly. I found a snake already. I ate dinner at a gas station already. I got stuck behind a tractor on the road already. But the people are friendly. Really friendly. And by God, there is no substitute for this. They work hard. Damn hard. Laborers. Military. Jobs that command my respect. This is rural Mississippi, my new stomping ground from roughly Monday morning to midday Thursday until some time in May. So, where do I go from Thursday to Sunday? Well THAT is a totally different story. And THAT is something we will discuss next week. · I completed my almost 17 year banking career on Friday. Currently, I have no house or job. · What am I going to do? As I tell my mother, don’t worry about me. I will figure it out. · There is not enough time in my life to do everything I would like. But I will try. · I may not be able to walk when I’m 65. Why would I wait until then to live? · What do you really want to do with your life? Are you doing it? Have you even thought about it? · I would rather be an outsider than an insider. · There is compromise, there is settling, and there is being someone you are not. · I am keenly aware that many worthwhile things in life involve a “we”. · If you hear an older person you respect say “I regret…”, pay attention. · I basically completed the 2018 NYC Marathon on pure willpower. · Did I change who I was? No. Did I discover who I was? Yes. · I am a disrupter, but my heart is always in the right place. · Leave your “yes men and women” now and again. · If it’s not interesting, you’ve lost me. · There is no better feeling than being real. · I hope you haven’t gotten lost in my journey, instead energized to refocus on your own. · Living is a daily art. Hourly even. Not a weekend thing. · There was a time in Mexico City where I thought “this isn’t going well”. · You have to start believing in yourself! · abk isn’t about the answers. It’s about the questions. · Facing my fears and owning my imperfections is what freed me, not quitting my job. · Less talk. More doing. · I completely unwound and re-wound my life in 671 days. · If you find yourself saying “life gets in the way”, pause and try and fathom what you just said. · I want to do something that no one has ever done before. · I don’t want a 9-5 or picket fence or cul de sac or power or fancy title. I do need health insurance though. · I need a new set of unknowns. · Lots of this process was very uncomfortable. I felt like publicizing it could help someone. I hope it did. · It turns out I do have emotions, which is good. · Thank you to so, so many people! · abk was a letter to myself, so if you were ever offended, good, but I wasn’t talking to you. Except that I was. · You must own your life story. Reinvent yourself as many times as needed. · When you do something against the grain, the most resistance often comes from those closest to you. · I have 12 tattoos. · I call this last 2 years The Great Awakening. · Use your experiences to help someone. Want nothing in return. · Becoming a parent rocked my world. · Can you really live your dreams? We shall see. · New life, new adventure. It took exactly 671 days for me to completely unwind and re-wind my life. From May 15, 2017 to today, March 17, 2019. It was hard. Man, was it hard. I was uncomfortable for most of every single day. But that was the point. I was getting to know myself. Intimately. Like so many people, I had taken the time and interest to try and get to know family, friends, clients, prospects, and acquaintances, but I had subconsciously ignored the most important person of all: myself. There were things going on around me that couldn’t just be a coincidence. A couple of major life events. Meeting new people. A friend writing a book about being your 100% self. A friend constantly in my ear using the term “borrowed beliefs”. The opportunity was swirling all around me, so I decided to go all in. It was a massive risk. I could have lost everything. I was aware of that. But becoming vulnerable was the secret sauce. I needed to be free. Free from what? Everything, really. Most importantly, everyone else’s thoughts. I needed to be free from traditional thinking. I needed to find the courage to act on how I truly wanted to live. For once in my life, I was going to fully walk the walk. All in. Massive risk. Hopefully, massive reward. Making the decision to move halfway across the country was no problem. Making the decision to sell the house was no problem. Making the decision to resign from my traditional job was no problem. Unwinding 34 years’ worth of “borrowed beliefs”? You know, beliefs that weren’t truly mine? That was a MAJOR challenge. Pick a topic. If I couldn’t tell you why I believed what I did, it went under the microscope. Politics, marriage, religion, fatherhood, career, money, diversity, philanthropy, kindness, sexuality, spirituality, traditions, and so on. This was an insanely tough exercise, so I had to make it fun. Hence, the travel. It was awesome, but what did you think I was doing at the airport, on the airplane, and on the long drives? Playing on Facebook? Nah, I was deconstructing and reconstructing my life. Intentionally. So I could live the way I wanted to live. This exercise essentially saved my life. Not physically. No, it just saved me from sleepwalking through the next 30 years. It saved me from feeling stuck for the next 30 years. It saved me from living the life constructed by marketers for the masses, and instead finally persuaded me to follow my passions. Travel, sports, inspiring others, and even writing. Who knew? I couldn’t live my life anymore not being 100% me. If you know me, you know I have two speeds: all in and all out. No in between PC nonsense. All out wasn’t an option, so all in it was. And I got so comfortable being uncomfortable, there is no chance I am ever going back. So I’m starting over. At 36, I’m reborn, and I have never felt so alive. I’m living life on my terms, with intention, purpose, and passion. Lots of people are telling me what I should do next. Job offerings. Ideas for abk. So on. Thanks, but no thanks. Here is what I do want to tell you though. If you go see the world, if you leave your neighborhood, if you leave your tribe, you are going to meet people. Some really freaking incredible people. That believe the complete opposite of you. That have done something that you do not agree with. Or maybe you’ve done something that they do not agree with. Regardless, engage them. Smile at them. Their world may be completely different from yours, which is why they believe what they believe, and there is nothing wrong with that. Don’t shut them down. Don’t brush them off. Listen to them. Learn. Everyone is different. Everyone has different pasts. Everyone has different challenges. I certainly have mine. People generally are kind. But for whatever reason, we get in our own way, overthink things, and talk our way out of amazing opportunities due to irrational fear within ourselves and fear of other people’s opinions. Not this time. I faced every fear that I had on this journey, all 243 of them, and I won. What are my new beliefs? I’m glad you asked. I believe in travel, leaving your comfort zone, open mindedness, and using your unique abilities to help others. That’s kind of it. I now live in roughly 4 hour intervals, with limited concern for both the past and the future. I’m here. You’re here. Let’s be here. So say goodbye to the Baptist-raised, apolitical, banking Vice President, MBA holding, Mars Hill and Wingate grad, All American soccer player, blah blah blah. What a riff-raff. What an absolute riff-raff. And just say hello to Benj. I’ve done the work, and I’m going to keep doing the work. I love life, and it’s a pleasure to meet you. At approximately 3pm this past Thursday, I stood on the 15th green of the venerable East Lake Golf Club in Atlanta, Georgia, looking over a birdie putt with my caddie Brian. The round had gotten off to a less than stellar start, but I had just birdied 14, so I was hyped. For those of you who don’t know, East Lake is the home of the PGA Tour’s annual season ending Tour Championship, and so the fact that I was even there was quite exhilarating. Walking where Tiger walked. Walking where Bobby Jones walked. And everyone in between. I hadn’t seen my son Banks in 25, yes 25, days. We were both running on FaceTime fumes, wanting to interact each day but knowing that our real bond lies within our ability to touch. So I had set out an idea a couple of weeks ago to fly in to Jackson, Mississippi on Thursday, catch a ride with my pal Kris, and make the 2 hour drive and go surprise my crew. But as you know if you are doing any kind of living, nothing ever goes to plan. And that’s okay. It was Mardi Gras last week, so airline ticket prices were jacked. My golf outing in Atlanta had gotten rescheduled 3 times due to cold weather. But contrary to the old me, I just let things fall into place and then made my final decision literally Wednesday night. Hotel in Georgia, enjoy the round, drive 6 hours to the Gulf Coast. Everything eventually fell into place, with me barging through the doors at roughly 11:05pm CST to one person in on the secret, two people stunned, and a (not so) little boy that had already gone to sleep. I tried to wake him, but he sleeps like his mom, needing a bona fide national emergency to have any chance of rustling them. I decided I would just cozy up to him so that when he did awake, I would be the first thing he saw. It happened about 5am, and it was glorious! I was reminded via a conversation I had last Sunday that the vast majority of people will never get to play at places like East Lake Golf Club. Most people will never run the NYC Marathon. Many will never have the courage to explore Mexico City or the resources to trek across Northern Italy. I don’t take any of this for granted. I have indeed done some wild stuff over the past almost 2 years, pushing every limit that I have and then some. It was fun, at times insane, painful, fulfilling, and rewarding. By my estimate, I travelled somewhere between 100,000 and 125,000 miles in this time period, doing and seeing everything and talking to and learning from anyone and everyone that I could. But nothing, I repeat nothing, came anywhere close to the simple stuff: the hugs, the smiles, the chaos, and of course that first basket . Stay tuned for my final thoughts over the next two weeks, friends, and then a new chapter begins.